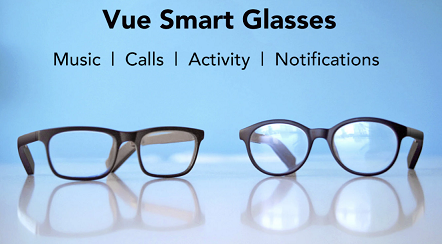 The Vue smartglasses don't look like a gadget. Ironically there is no tech appearing outside when you see them. All of the smarts are located inside the casing. These are the world's first pair of smart glasses that are discreet. You can use these at home, work and almost anywhere with added tech to your routine. Listen to music, Track fitness activities, Make calls, Find your glasses, Gesture controls, Listen to navigation, Report time, Bone conduction audio, Wireless charging, On detection, Customizable styles. It works almost up to 7 days standby and has support for prescription lenses or sunglasses. What else you want? Vue will replace your conventional fitness trackers, headphones, and even prescription glasses. At the most basic level, you can order the lenses you depend on, whether they are prescription, non-corrective (Plano) or sunglasses. Its recent API development features also include Nod to answer a call, Tilt your head to cycle songs, Shake your head to ignore calls, Detect your posture and much more. Vue's technical specifications are mesmerizing which includes its 3.7V 90mAh Li-Po battery, Wireless charging, water-resistant design, iOS and Android compatibility, Bluetooth support, 6 axis accelerometer & gyroscope, infrared proximity sensor, 5 field capacitive touchpad, Stereo bone conduction speakers, sound leakage prevention design, ARM Cortex M3 processor and extremely lightweight design.